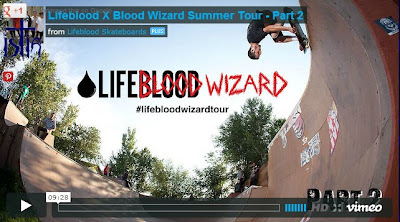 In the midst of one of North America’s hottest summers on record, Lifeblood and Blood Wizard joined up for a road trip out to Colorado and back this past July with the desire and intentions to shred as much skateable terrain as possible for ten days straight. Part 2 of our "Blood Brothers" summer tour video delivers a barrage of action from several skate spots and parks in the mile high state of Colorado including North Glenn, Broomfield and Arvada. Join Kevin Kowalski, Dalton Dern, Cody Lockwood, Mason Merlino, Jack Given, Anakin Senn, Jerry Gurney, Chris Gregson, Toad, Johnny Turgesen, Bryce Kanights, Joey Martin, Frank Faria, and Mark Scott for another episode of summer fun. Our limited edition "Blood Brothers" collab board is available now at skateshops and through unheardpdx.com and strangebirddist.com. Get on board!